Looking for a spacious log cabin in the Smokies? Browse our 8 bedroom cabins in Gatlinburg! These big Smoky Mountain cabins are excellent for accommodating large groups in comfortable luxury. Discover why our large group Gatlinburg, TN cabin rentals are perfect for any occasion. Whether you are planning a family gathering, church retreat, or attending a Smoky Mountain conference, these roomy cabin rentals are an excellent choice. Make your family reunion or gathering in the Smokies a success when you book online with us! Save time, money, and stress when you choose to comfortably accommodate your group in one of our Gatlinburg cabins for groups. There are many advantages to having your group or occasion centered in a large Smoky Mountain cabin. First, you will enjoy a comfortable central meeting point to gather at the end of the day and trade stories from your day in the Smokies. Also, your group can enjoy any occasion in the privacy of their cabin rental. Visitors to the Smokies often choose to conduct weddings and private celebrations in the flexible space provided by our cabins. After all, the location you choose to mark an occasion or gathering is important! These luxurious accommodations are perfect for making special memories in the Smokies. Are these rentals not large enough for your celebration? Please contact the reservations office of Cabins USA Gatlinburg. We would be happy to direct you to groups of cabins that are in within walking distance of each other. On the other hand, if these large group rentals offer more space than you need, see if our cabins for large families may provide a better fit! Remember, when you book online with us you will receive a 15% discount! 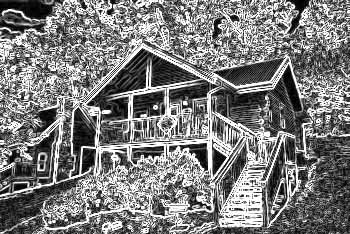 Guarantee your group an excellent Smoky Mountain vacation by booking our superbly located rentals. These large cabins in Gatlinburg are some of our cabins near Dollywood in Pigeon Forge, Tennessee. Also, these luxury large cabins are near the endless attractions of the Pigeon Forge Parkway so that you can spend less time driving and more time experiencing the Smokies! Want to see breathtaking views in Pigeon Forge? Book your big cabin near Dollywood that sleeps 20 guests with outdoor/indoor resort pools and endless views. Escape to the Smokies when you book "Marco Polo" an impressive 8 bedroom cabin rental by Cabins USA Gatlinburg. Book today & save 15% on your nightly rate! "Mountain View Pool Lodge" is an elegant 8 bedroom cabin in the Smoky Mountains that boasts an indoor pool, a game room, and a theater room. "Grand Theater Lodge" is a luxury cabin in the Smokies that sleeps 24 guests, offers a theater room, game room, and a special 15% discount for an affordable stay! Bring your family and friends to "Indoor Pool Lodge," an 8-bedroom cabin in the Smokies that has it all: a game room, theater room, and a private pool.